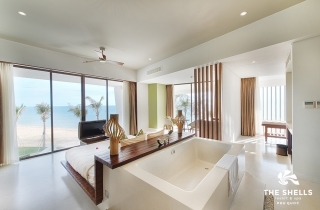 The Shells Resort & Spa is a luxury resort, unlike any other on Phu Quoc. 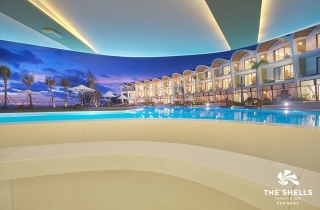 From the elegant white Terazzo walls and floors to the beautifully designed rooms, private beach and poolside parties, your stay at The Shells Resort & Spa will be a vacation to remember. Relax in our shell-shaped kid-friendly swimming pool or at the adult-friendly pool bar. The pool area is awash with easy chairs, loungers and daybeds – ideal for whiling away hours and days for the perfect vacation. Out of the water, take a break on a lounge chair while enjoying the white sands of our private beach. Ocean View Deluxe room: US$115/ person on TWIN share basis. Ocean View Super Deluxe room: US$125/ person on TWIN share basis. What benefits do clients get? 01 Souvenir per Guest based on 2 guests per room. Please contact our Travel Managers to book your memorable stay at The Shells Resort & Spa Phu Quoc today. Wonderful services, professional travel team with best care to travelers.